The latest version of helpdesk supports integration with Bitbucket and GitHub, popular code repository hosting platforms and an issue trackers. This integration module lets you create "linked" issues in a Bitbucket or GitHub repository right from the helpdesk ticket page by clicking one single button. 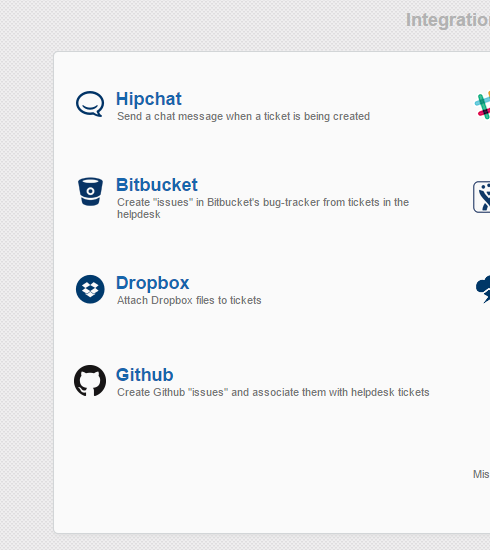 After that both the Helpdesk ticket and the corresponding Bitbucket/GitHub issue will contain links to each other. Go to "Administrator - Integration - Bitbucket". Click "Enable Bitbucket integration", enter your Bitbucket username and password and click "Save". Once you're done, you get a "Create Bitbucket issue" in every helpdesk ticket. Go to "Administrator - Integration - GitHub". 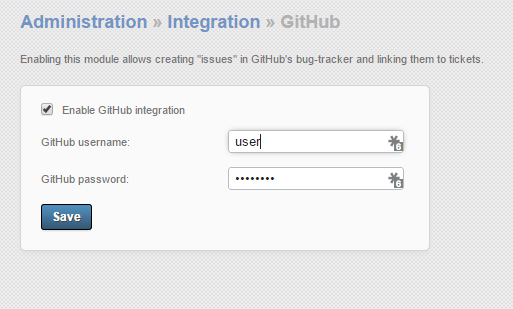 Click "Enable GitHub integration", enter your GitHub username and password and click "Save". Once you've done that, you will get a "Create issue in GitHub issue tracker" in every helpdesk ticket. After the issue has been created and linked to a ticket, the app displays a link to this issue in the "ticket details" sidebar. Unfortunately, any changes in the issue won't be synced back into the ticket. Whenever you want to check with the issue status in Bitbucket or Github - simply click this link. It's a great feature if you keep your issues in Github or Bitbucket – instead of going back and forth between your issue tracker and your help desk app and copy-pasting links, you can do it all with one button in Jitbit.